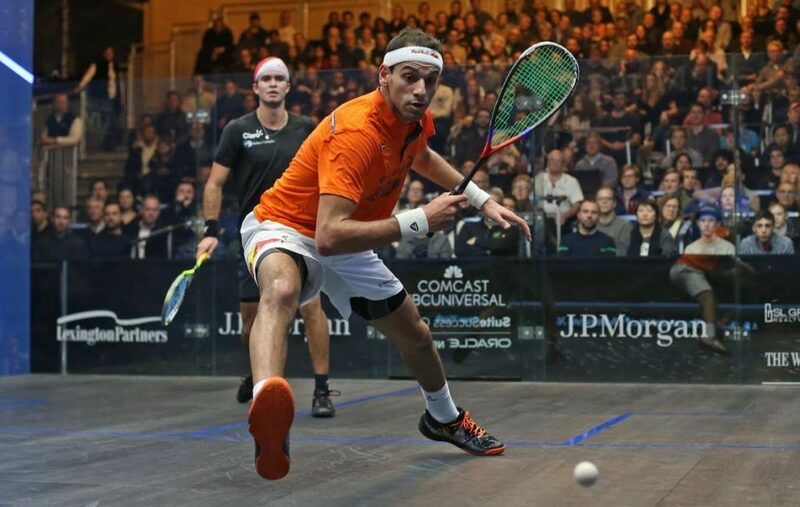 A quartet of Egyptians – containing reigning champions Mohamed ElShorbagy and Raneem El Welily – claimed victories on the opening day of quarter-final action at the 2018-2019 PSA World Championships in Chicago to ensure that there is guaranteed to be an Egyptian finalist in squash’s first $1 million tournament. ElShorbagy, the current World No.1, booked his place in the last four courtesy of a 3-1 win over Colombian World No.7 Miguel Rodriguez inside the Great Hall of Chicago’s Union Station. The pair met in the final of the sport’s longest-running tournament – the British Open – last May, with Rodriguez taking the win on that occasion. The South American took the opening game, but ElShorbagy stayed strong mentally and battled back to take the next three games without reply, winning 5-11, 11-7, 11-6, 11-6 to book his place in the semis. 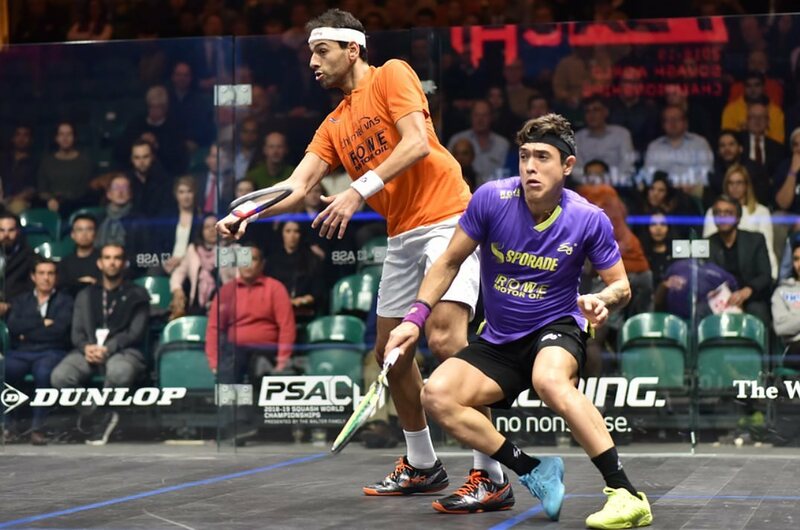 “I actually think this is one of the best times he has played against me,” ElShorbagy said. “From the first point I could see his focus, and I knew that I was one for a battle tonight. I could see that if I needed to win a point then he wasn’t going to give it easy to me today. I had to win the point myself and I had to extend the rallies as much as possible. It was very tough playing him tonight and every point we played, physically and mentally, I had to get my tactics right after I lost that first game, and I’m really glad I pulled through in the end. Compatriot and World No.3 Tarek Momen awaits ElShorbagy in the semi-finals after he defeated the defending champion’s brother, Marwan, in straight games. 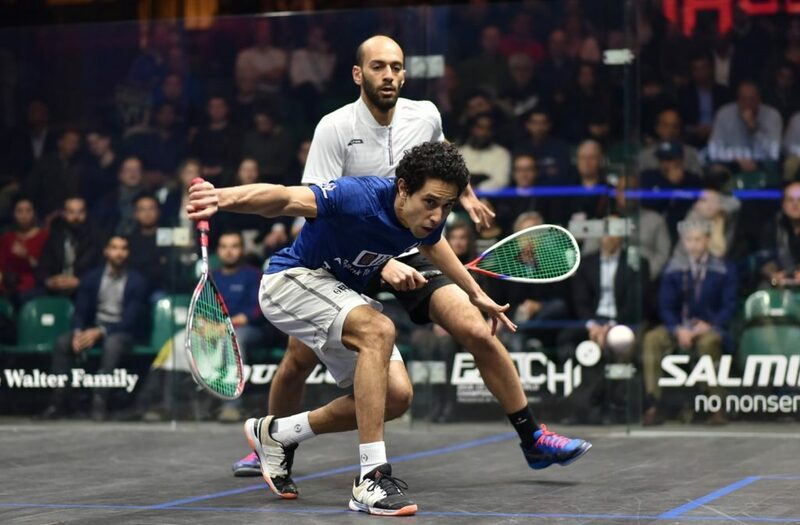 Marwan narrowly lost out to Mohamed in a historic World Championship final in Manchester back in December 2017, but was outplayed by Momen, who displayed some superb attacking touches during an 11-5, 11-4, 11-6 triumph to reach the semi-finals of this tournament for the first time since 2015. “This result is more than I could ever have dreamed of because I had a very tough five-game match with Abouelghar and to keep my hopes alive in this tournament, I needed an easier match today,” said Momen. Momen’s wife, World No.1 El Welily, will join her husband in the semi-finals after she saw off the challenge of World No.8 Nouran Gohar. 30-year-old El Welily lost out to her younger compatriot in the semi-finals of the Egyptian Nationals earlier this month, but she overcame her opponent by an 11-4, 6-11, 11-4, 11-2 margin, which extends her winning run over Gohar on the PSA Tour to four matches. “I was a bit nervous to be honest,” said El Welily, a three-time World Championship finalist. She will face World No.4 Nour El Tayeb in the next round after she ended the run of Hong Kong’s Annie Au, winning 11-5, 11-7, 11-6 in just 25 minutes. Au had beaten former World Champion Laura Massaro in the previous round to become the first player from Hong Kong ever to reach the quarter-finals of the sport’s biggest tournament, but she was unable to get into the match against a ruthless El Tayeb. El Tayeb’s husband – World No.2 Ali Farag – will contest his quarter-final fixture tomorrow against New Zealand’s World No.6 Paul Coll, and a win for the 26-year-old Harvard-graduate will mean that the World Championship semi-finals will feature two married couples for the first time ever. “For me, anyone who beats Laura, I worry,” said the 25-year-old Egyptian. Quarter-final action continues on Thursday February 28, with play starting at 17:00 (GMT-6). WSF and PSA have met the announcement on the proposed selection of additional sports for the Paris 2024 Olympic Programme with great disappointment. The proposed list of four sports only, of which three sports are already confirmed by the IOC on the Tokyo 2020 Olympic programme, leads to a belief that Paris 2024 and the IOC favoured sports already in the Olympic programme, leaving practically no opportunity for other sports. The unity that our sport enjoys globally is exceptional and is getting stronger by the day. 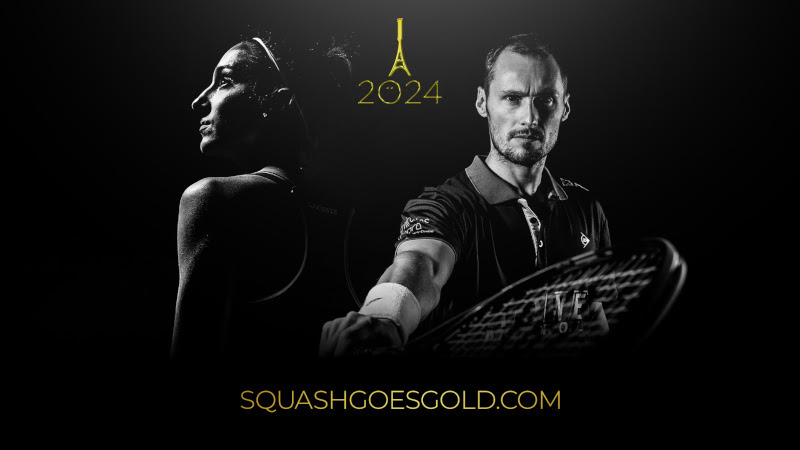 WSF and PSA are supported by the entire squash community and, with our athletes at the forefront, have run a strong campaign that respected the timeline and the criteria set by Paris 2024 and the IOC. During the campaign, we showed that squash has a vibrant and real forward-looking programme rooted in constant innovation, which strives for more inclusiveness and sustainability, youth engagement and equality across all of our activities in and outside of the court. We truly believe squash could seamlessly integrate into the Olympic programme with minimal costs and an optimised pool of participants. Our unique interactive glass court would allow squash to bring a lot of additional excitement and spectacular action to any iconic monument of the host city or shed a new light on less known urban areas, while also helping to engage young people in the sport from day one of the preparations and well beyond the Olympic Games. WSF et PSA ont accueilli avec une grande déception l’annonce de la sélection de sports additionnels proposée pour le programme olympique de Paris 2024. La liste proposée ne contenant que 4 sports, parmi lesquels 3 sont déjà confirmés par le CIO dans le programme de Tokyo 2020, on peut se poser la question de savoir si des sports déjà présents dans le programme olympique n’ont pas été favorisés par Paris 2024 et le CIO ne laissant pratiquement pas d’opportunité pour d’autres sports. L’unité de notre sport au niveau international est exceptionnelle et se voit renforcée tous les jours. WSF et PSA, soutenus par la famille entière du squash et avec nos athlètes à l’avant-garde de ce mouvement, ont mené une campagne forte dans le respect des timings et des critères imposés par Paris 2024 et le CIO. Au travers de cette campagne nous avons montré que le squash proposait un programme dynamique et résolument tourné vers l’avenir, animé par la volonté d’innover, d’assurer l’inclusion, la durabilité, l’engagement auprès des jeunes et l’égalité des chances dans toutes nos activités sur le terrain et en dehors. Nous sommes convaincus que le squash peut facilement intégrer le programme olympique avec des coûts minimes et un nombre limité d’athlètes. Notre court vitré interactif permet de développer des actions spectaculaires et dynamiques au pied de n’importe quel monument historique de la ville hôte ou bien de mettre en lumière des quartiers moins en vue et d’impliquer les jeunes dans le sport dès le premier jour des préparatifs et bien au-delà des Jeux. Today’s announcement in her home country Malaysia that Nicol David is bringing to a close her illustrious playing career in squash signals the end of a unique era in the sport. Since making her debut on the international stage in 1996 when she won the British Junior U14 Open title as a 12-year-old, this formidable woman from Penang has blazed a phenomenal trail through the sport, creating record after record. Now 35, David became the first player to win two world junior titles in 2001 before going on to accumulate a record eight senior individual world titles amongst a total of 81 PSA World Tour titles from 102 final appearances. In 2015, David established a record 109-month unbroken run as world No.1 – and in Malaysia she is recognised as the country’s most successful Asian Games athlete with 7 gold medals (5 individual and 2 in team championships) in the quadrennial event. David was inducted into the World Squash Federation ‘Hall of Fame’ in 2011. In the statement issued in Malaysia today, David said: “After more than 20 years playing squash for Malaysia, competing on the professional tour and achieving the utmost best from my career being the only Malaysian athlete to achieve these accolades and to be recognised as the greatest female squash athlete of all time by my peers, I can proudly say that I am ready and happy to announce my retirement at the end of this seasonal tour. “This is a moment that every athlete must go through – to explore fully on what more there is in store for them. I am now at this point in my life, ready to take on more beyond the pro tour. “This decision has been thought through for quite some time and I do know this is my last season. My mind and body have battled it out to stay at the very top of my game for such a long time that I feel that I only have this last big push left for the final season to give it all I have before I enter the next phase of my life. “1. To Squash by joining PSA (Professional Squash Association) to work with them closely to raise the awareness of our sport globally and to build a support team for our professional squash athletes as they continue to raise the bar on tour. “2. 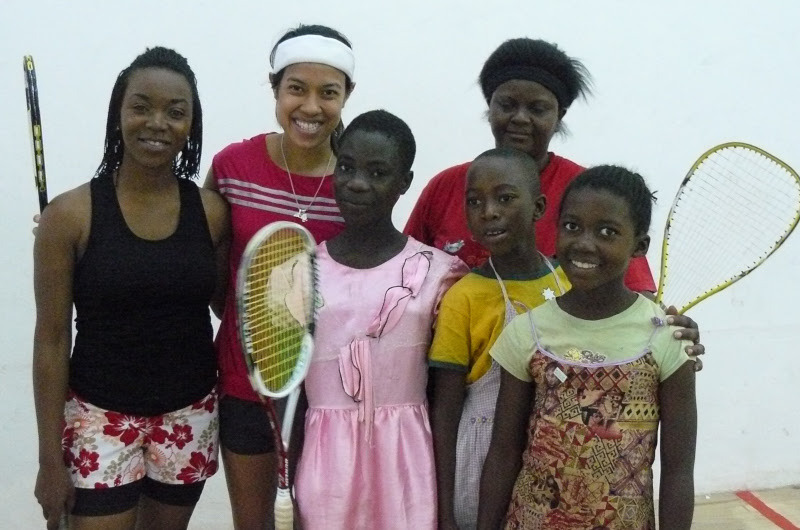 To Malaysia’s younger generation through the Nicol David Foundation which seeks to empower girls through sport to reach their full potential. This will be refined fully in a strategic partnership with PwC to create the best structure and programme moving forward to have more girls playing sport, improve their study skills and soft skills too. “3. To the People in Malaysia, I will be sharing my story, ‘Nurturing Belief’, through a series of talks and writings. “This is just the initial start of more exciting things planned and I cannot wait to venture into this next phase with all of you after my squash on tour. “Throughout these next few months till the end of the seasonal tour in June, I will be sharing through my ‘The Dream Remains’ campaign, everything that my life in squash has given me. Andrew Shelley, CEO of the World Squash Federation, said: “Nicol’s playing record speaks for itself. She had already become a legend several years ago. Her results have been very special, but so is she. “I can well remember trying to manoeuvre the winner and runner up of the British Junior Open under 14 event in 1997 into standing and smiling for a presentation photograph. The winner was Nicol, the runner up Omneya (Abdel Kawy) – and yes, at that time the girls hadn’t got to grips with smiling! “Since then Nicol has not only developed a smile, but grew from girl into woman with such a warm and winning personality that has marked her as special both on and off court. “It has been a privilege of mine to have watched her blossom in both respects. Running the Women’s Tour during so many years of her success, like everybody else I saw her wonderful athleticism so well-honed by Liz Irving, her drive to succeed, but also her humility. Her opponents have always been respected, those who have helped or simply supported her received sincere thanks, never a hint of diva, dealing with defeat, …. and always that smile. “More than this, she would always give of herself. ‘No’ was such a hard word for her. From the Women’s Tour perspective, the burden of interviews was accepted with good grace. More than that, from 2002 onwards, Nicol would always say yes to the onerous WISPA Promotional Tours and latterly the WSF Ambassadors Programme (above image showing David with youngsters during the Malawi visit in 2012) whenever she could. And how the players and organisers from the ‘young’ squash countries loved her! “All this followed the 19-year-old realising that in order to achieve her potential she had to move to Europe, leave her family and friends, and make her way on her own. She succeeded as we know – another accolade. “For so many years as world number one, Nicol ‘carried’ the Tour. She was the face of it – and Malaysian sport too. She was the Ambassador. She was being pulled this way and that. She graciously dealt with it all. “One can have no doubt that her next life phase will be a great success, with her drive and captivating style. 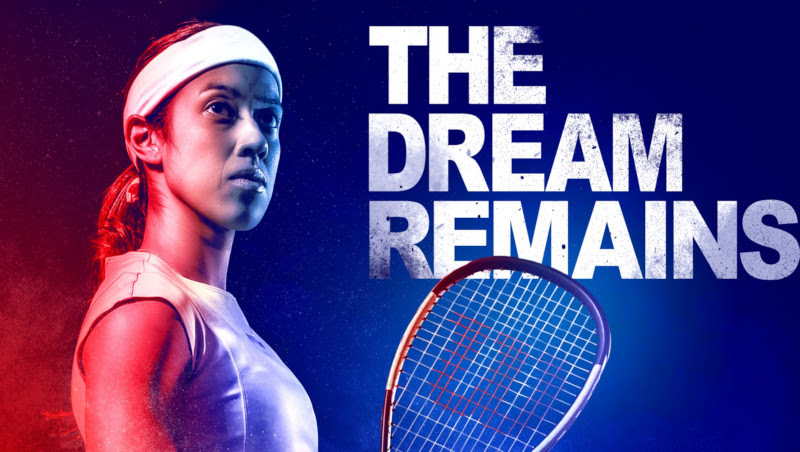 She says that the dream remains, so not only has squash had a wonderful career to watch, but thankfully we know that Nicol will continue giving of herself in many ways in the future. 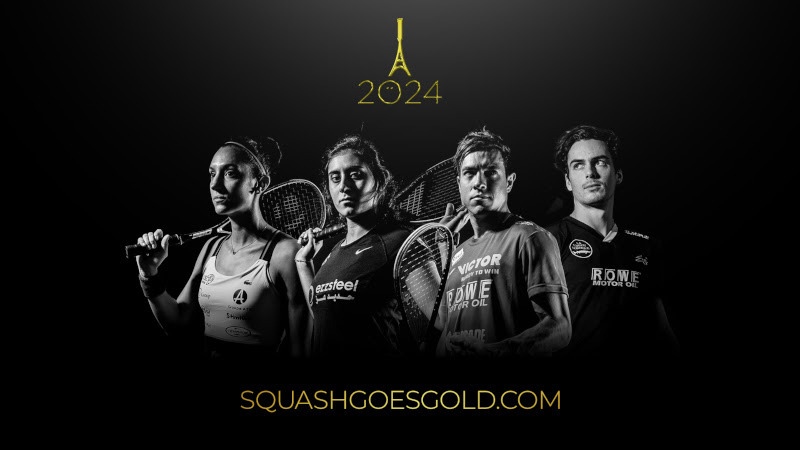 The World Squash Federation (WSF) and Professional Squash Association (PSA) have today launched an ambitious new campaign – “Squash Goes Gold” – aimed at giving the global squash community the opportunity to take an active part in the sport’s future, including the bid to become part of the Paris 2024 Olympic Gamesprogramme. Alongside a series of other strategic initiatives launched over the past year, such as the youth-focused SquashFORWARD programme, Squash Goes Gold aims to shape the future of the sport and make it even more innovative, inclusive and sustainable. Launched ahead of the biggest tournament of the year, the 2018/19 PSA World Championships presented by the Walter Family – which will see squash played inside Chicago’s Union Station just weeks after the 2019 J.P. Morgan Tournament of Champions took place inside Grand Central Terminal in New York in one of world sport’s most unique venues – Squash Goes Gold www.squashgoesgold.com aims to build on the sport’s global growth during the past decade and will allow players and fans of the game in all corners of the world to come together in support of one common goal: seeing squash join the Olympic Games programme. “Squash is played in some of the most spectacular locations in the world – in front of the Pyramids of Giza, on the harbour-front in Hong Kong, inside Grand Central Terminal in New York – and our ability to showcase the beauty, youth and innovative drive of Paris by setting up an all-glass court anywhere in the city is something few sports can do,”said WSF President Jacques Fontaine. PSA CEO Alex Gough said: “The Olympic Games is the greatest sporting event in the world and there’s no question that a Gold Medal would be the pinnacle for any squash player. “As a sport we have made huge strides forward in the past decade; uniting the men’s and women’s professional tours, enabling us to reach parity in men’s and women’s prize money at major events, dramatically improving the sport’s broadcast arm and continuously improving both the spectator and viewer experience. France’s top ranked female player Camille Serme (featured in top image with French team-mate and former world No.1 Gregory Gaultier), winner of the World Games and major PSA titles such as the British Open, U.S. Open and Tournament of Champions, is playing a pro-active role within the bid campaign which is aimed to get squash a place on the Paris 2024 sports programme. Serme said: “The chance to compete in an Olympic Games would be a dream come true – the chance to compete in an Olympic Games in my home city would be unbelievable. The following article has been translated from its original source. The original article can be viewed on the Francs Jeux website. The bid for the inclusion of additional sports for the 2024 Olympic Games in Paris is in full swing. The French Organising Committee needs to hand a shortlist containing its recommendation of sports to be included to the IOC in March. This list will be looked into, discussed and might even be amended. The final decision won’t be made before the end of 2020, after the Tokyo Olympics. After several unsuccessful bids to be included as part of the Olympic programme, squash is regularly mentioned amongst the strongest contestants. The sport has learned the lessons from its previous failures and has progressed. Now, all the arguments are set. Jacques Fontaine, President of the World Squash Federation (WSF), explains all about the Olympic bid to FrancsJeux. Jacques Fontaine: We have indeed started our bid early, from 2017, thanks to an agreement between the World Squash Federation (WSF) and the Professional Squash Association (PSA). Its goal was to unify the squash community around the same Olympic ambition and, therefore, to guarantee the attendance of the world’s best players at the Olympic Games, if we are chosen. With the agreement, we have been precursors, which was perceived by the IOC and the French Organising committee. After that, in January 2019, we met the Paris 2024 team to give them a presentation of our bid. It was also a way to express the unity of the group, because we – WSFmembers – were accompanied by a PSA delegation. Two French players also attended: France No.1 Camille Serme and European Junior Champion Victor Crouin. They expressed their ambition to gather a medal, especially the gold medal. JF: Squash’s success at the Youth Olympic Games was above our hopes and expectations. We were actually a bit surprised. Over 25,000 people came by the squash venue. Within those spectators, some IOC members were very determined to play on the glass court we had set up, which was particularly innovative because it included the interactive wall. The system enables the best players to train, and helps people to discover the sport with a similar approach to the one offered by video games. With this concept, we matched one of the IOC expectations: offer a special activity, a novelty, and appeal to a non-specialised public. JF: We have learnt from the past failures, and we have listened to everyone’s comments. This Olympic bid is truly new. For the first time, all the squash community is united around the same Olympic ambition. In addition, the innovation brought by the interactive wall is giving to the bid a more modern approach. JF: It would involve 64 players, with 32 male and 32 female players. We would only need one single court, which would be used for practice and for the competition itself. It would gather all the world’s best players, likely including some of the current best youth French players, in a spectacular and dynamic atmosphere. JF: Definitely. Concerning the costs, things are very clear: the competition will be played on a single glass court, which only requires a 70m² surface on the ground, and 25 hours to set up and 15 hours to dismantle. 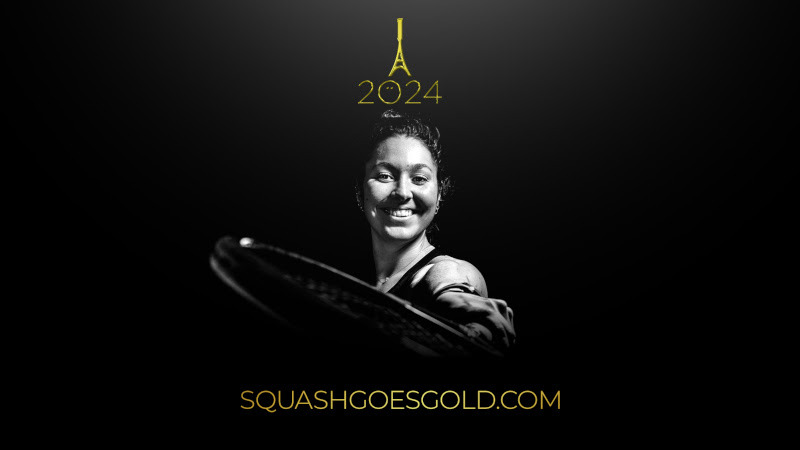 The French Squash Federation owns several, and they would lend one to the Paris 2024 Olympic Games. If you include 5000 seat stands, the complete squash venue could fit inside a 5-6000m² area. There are plenty of iconic venues in Paris that could feature this layout, like the Trocadero or the square in front of the Paris town hall. The list is consequential. This layout completely matches with the costs and sustainable stakes. Concerning heritage, we have anticipated this matter by multiplying contacts with all the towns and counties of the Grand Paris, where the Paris 2024 Olympics would help to develop the sport. For such an urban sport as squash, there would definitely be a before and an after to Paris 2024. New Zealand’s Paul Coll has risen to a career-high ranking of World No.6 in the PSA Men’s World Rankings for February. Coll, the highest ranked Kiwi male since Ross Norman in 1993, reached the quarter-finals of the J.P. Morgan Tournament of Champions at New York’s Grand Central Terminal in January. As a result, the 26-year-old has risen a place to overtake Colombia’s Miguel Rodriguez, who moves down to No.7. 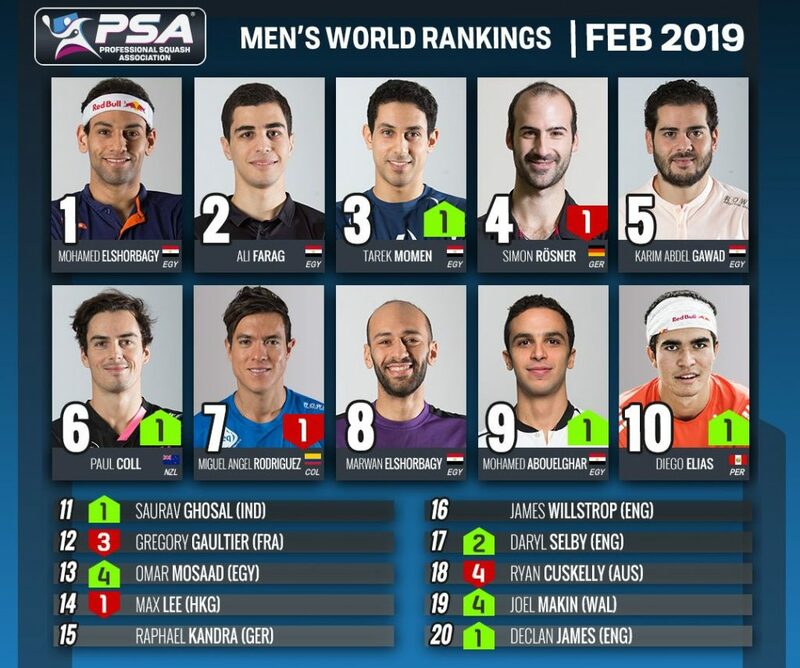 Egypt’s Mohamed ElShorbagy stays atop the rankings for a 12th consecutive month, but he is guaranteed to lose top spot to World No.2 Ali Farag on March 1st. ElShorbagy’s ranking points for the Windy City Open – which he won – will expire at the end of this month, meaning Farag’s points average will be higher going into March. Tarek Momen makes it an all-Egyptian top three after overtaking Germany’s Simon Rösner, while Karim Abdel Gawad completes the top five. ElShorbagy’s younger brother, Marwan, and Mohamed Abouelghar take the other spots inside the top 10. 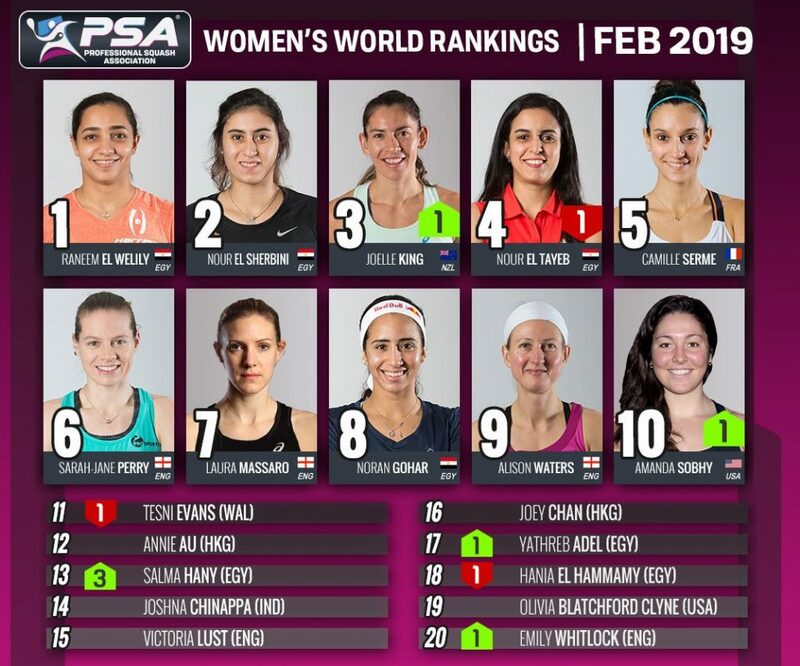 New Zealand’s Joelle King has claimed a career-high ranking of World No.3 in the PSA Women’s World Rankings for February. 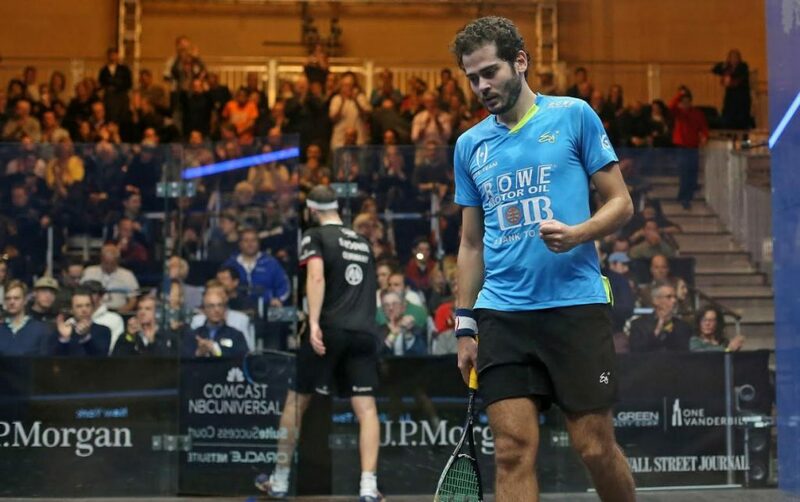 Egyptian duo Ali Farag and Nour El Sherbini are the 2019 J.P. Morgan Tournament of Champions winners after contrasting victories over compatriots and top seeds Mohamed ElShorbagy and Raneem El Welily in New York’s Grand Central Terminal. In the women’s final El Sherbini became the first woman to win the Tournament of Champions on three occasions after a dominant victory over World No.1 El Welily saw her retain her title. The pair were meeting for the first time since the latter had ended the former’s 31-month reign at World No.1 last month and El Welily – the 2015 Tournament of Champions winner – came into the match with a narrow 10-9 lead on their head-to-head record. But things went El Sherbini’s way this time around as the 23-year-old put on a masterclass of attacking squash to lift her 18th career PSA title, but her first of the season. “This is my lucky place, this tournament was my first ever Platinum win and now it’s the first one I’ve won three times,” said El Sherbini, who won the ToC in 2016 and 2018. An Egyptian quartet will feature in the finals of the J.P. Morgan Tournament of Champions for the first time ever as the world’s top four players – Mohamed ElShorbagy, Ali Farag, Raneem El Welily and Nour El Sherbini – get set to do battle for the PSA Platinum title in New York’s iconic Grand Central Terminal. World No.1 ElShorbagy and World No.2 Ali Farag will go head-to-head in the men’s final after respective wins over World No.5 Karim Abdel Gawad and World No.4 Tarek Momen. 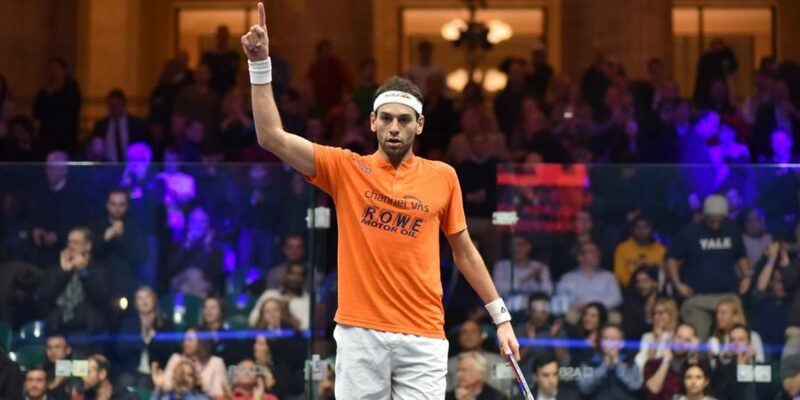 ElShorbagy avenged his defeat to Gawad in last month’s Black Ball Open by taking a 7-11, 11-7, 11-8, 11-6 victory which sees him reach the final of this tournament for the third time. The win also means he is guaranteed to retain his No.1 ranking in February – a defeat to Gawad would have meant that Farag could have taken top spot had he won the tournament. “I trained the whole summer to be in these kind of situation,” said ElShorbagy, who came through a brutal 73-minute fixture with Peru’s Diego Elias in the previous round. “If I didn’t back it up today physically, if I was going to lose today, then it would have been because he was better than me, not because I was physically tired. ElShorbagy and Farag will now contest a second Platinum final in a row, while it will be the ToC’s first all-Egyptian men’s final. Farag will look to get his own back after losing in straight games in the final of November’s Hong Kong Open. Harvard-graduate Farag bowed out in the semi-finals of the Tournament of Champions last year after losing to Momen, but this time the win went the way of the former as he closed out an 11-9, 11-8, 11-3 triumph in 42 minutes to reach his fifth PSA Tour final in a row. “It is not hard to say that it is tough to play against Mohamed,” said Farag. The women’s final will also be contested by the World No.1 and World No.2 as Raneem El Welily and Nour El Sherbini claimed semi-final wins over World No.4 Joelle King and World No.3 Nour El Tayeb, respectively. El Welily got her revenge for her Hong Kong Open final defeat against New Zealand’s King as she recovered from a game down to win 9-11, 11-4, 12-10, 11-9 after a high-quality 50-minute battle. “The entire match was very tough, mentally and physically, it was brutal,” said El Welily, the 2015 Tournament of Champions winner. Meanwhile, defending champion El Sherbini defeated El Tayeb in a repeat of last year’s final. The 23-year-old snuck wins in games one and three, before powering home to victory in a one-sided fourth game to seal a place in her third Tournament of Champions final. El Sherbini and El Welily will now go head-to-head for the 20th time on the PSA Tour, with El Welily winning 10 of them. 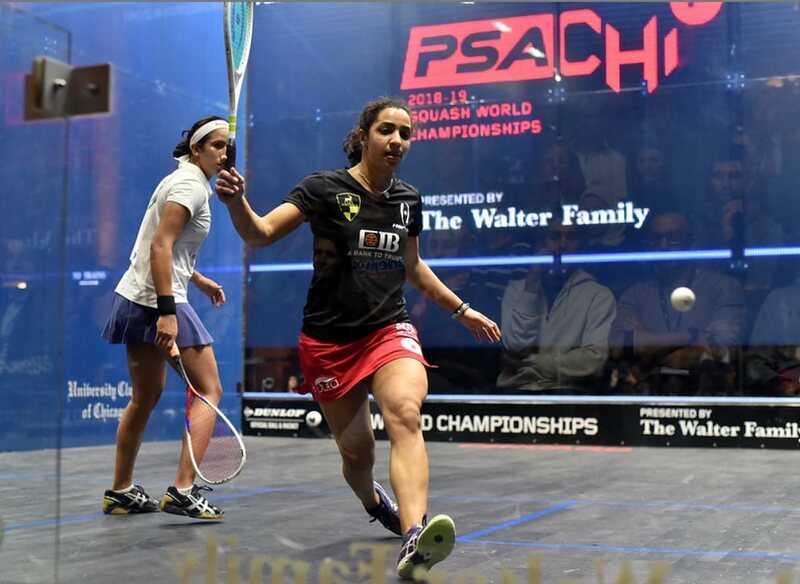 It will be the 12th time that they will have contested a PSA Tour final, and El Welily has taken the win on six of those occasions. “It means a lot [to reach the final], I wasn’t really happy with my squash over the last few months, but I’m happy that I went back home, regrouped and trained hard,” said El Sherbini, whose 31-month reign at World No.1 was ended by El Welily last month. 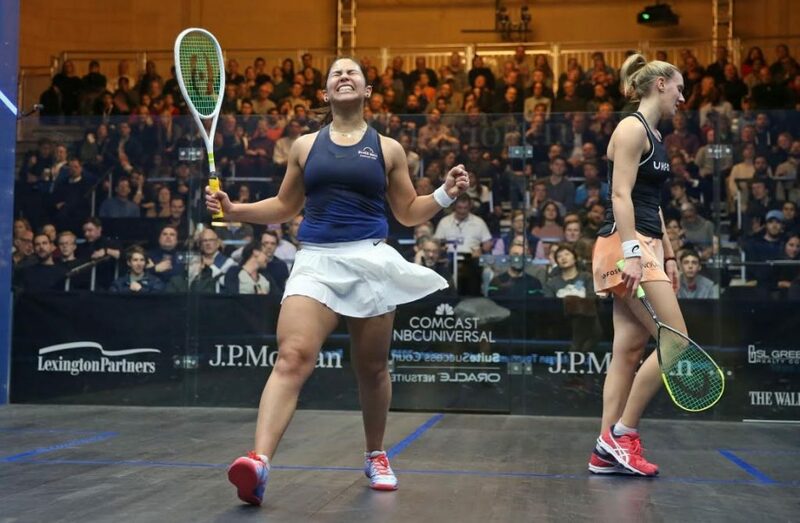 New Zealand’s Joelle King has become the only non-Egyptian to reach the semi-finals of the J.P. Morgan Tournament of Champions after she overcame 2017 winner Camille Serme at New York’s Grand Central Terminal on Day Seven of the .PSA Platinum event. King, 30, won her maiden Platinum title at her last event – the Hong Kong Open – and she moved to within one win of back-to-back finals after she recovered from an 11-1 loss in game one to take the win in four games. “I guess I laughed and said to myself that the only positive thing to come out of that [first] game was that I got a point,” said King. “I just tried to relax and start again and see what happened. Someone like Camille, if she gets on a run and gets confident, she is so hard to play. I just tried to weather the storm and hang in there. The World No.4 will play World No.1 Raneem El Welily in the semi-finals in what will be a repeat of their final clash at the Hong Kong Open. 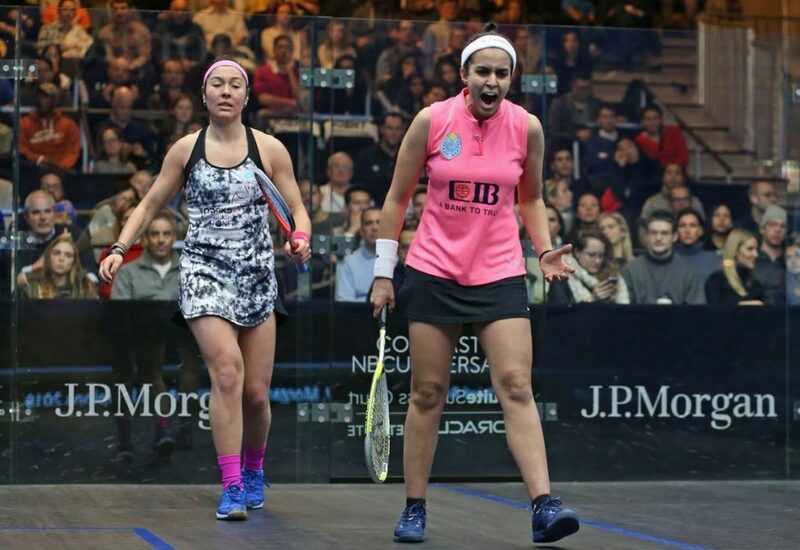 El Welily overcame World No.8 Nouran Gohar by an 11-6, 11-9, 11-4 margin in just 28 minutes and is now one win away from an eighth successive PSA Tour final – a run which stretches back to last season. “I was a bit sharper today than I was yesterday,” said El Welily, the 2015 Tournament of Champions winner. The other women’s final will be a repeat of last year’s final as defending champion Nour El Sherbini and World No.3 Nour El Tayeb go head-to-head in an all-Egyptian battle. El Sherbini dispatched World No.16 Salma Hany in straight games, while El Tayeb overcame England’s Alison Waters. The final two men’s quarter-finals also took place today, with World No.2 Ali Farag and 2017 runner-up Tarek Momen joining compatriots Mohamed ElShorbagy and Karim Abdel Gawad in the last four to make it an all-Egyptian affair. Farag overcame New Zealand’s Paul Coll by an 11-9, 11-7, 11-6 scoreline to reach the semi-finals of this tournament for the second time. “Paul has been giving trouble to everyone and he is a very, very tough opponent to play against,” Coll said. Farag will look to avenge his defeat to Momen in the semi-finals of last year’s tournament, with Momen axing World No.17 Omar Mosaad 3-0 to advance to the last four. “Omar was my first rival since we were eight or nine years old,” Momen said.